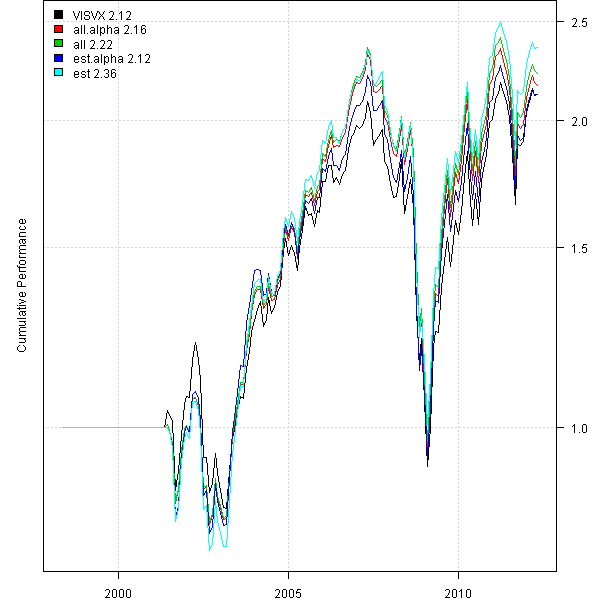 Let’s first replicate style and performance charts from the Three Factor Rolling Regression Viewer at the mas financial tools web site. Next let’s add the Momentum factor from the Kenneth R French: Data Library and run Factor Attribution one more time. 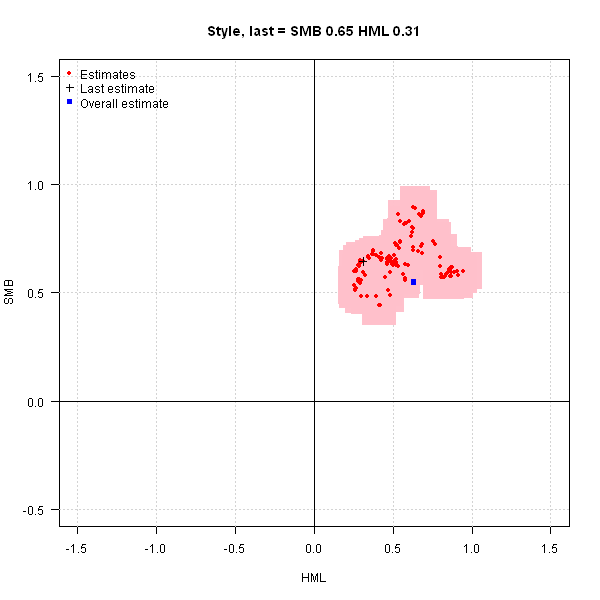 To visualize style from the Momentum point of view, let’s create a style chart that shows fund’s attribution in the HML / Momentum space. I designed the Factor Attribution functions to take any user specified factors. 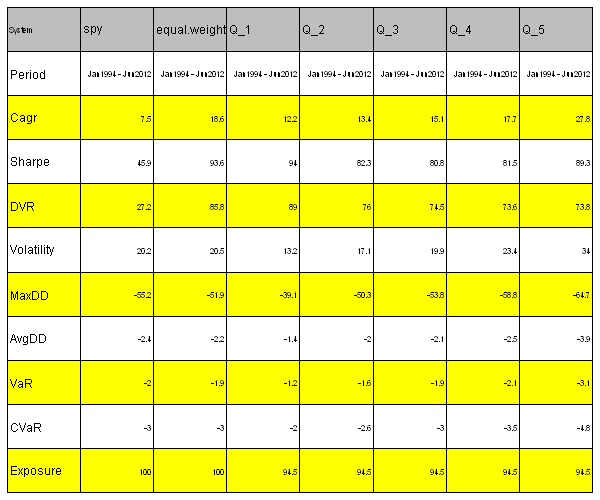 This way you can easily run Factor Attribution on any combination of the historical factor returns from the Kenneth R French: Data Library Or use your own historical factor returns data. 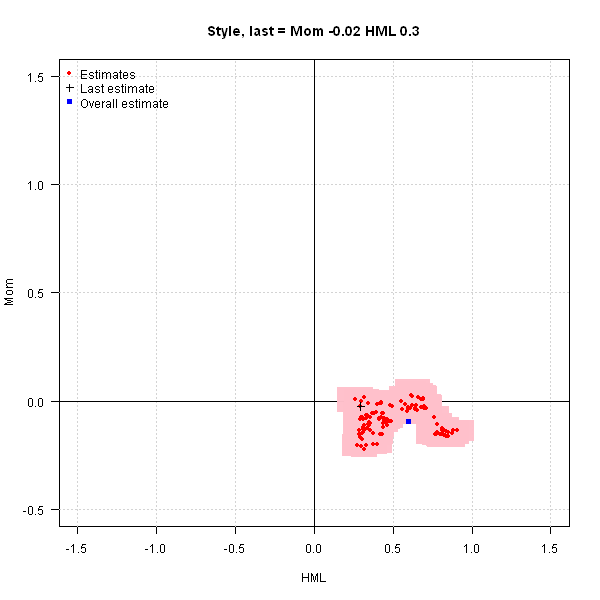 To view the complete source code for this example, please have a look at the three.factor.rolling.regression() function in bt.test.r at github. I came across a very descriptive visualization of the Factor Attribution that I will replicate today. 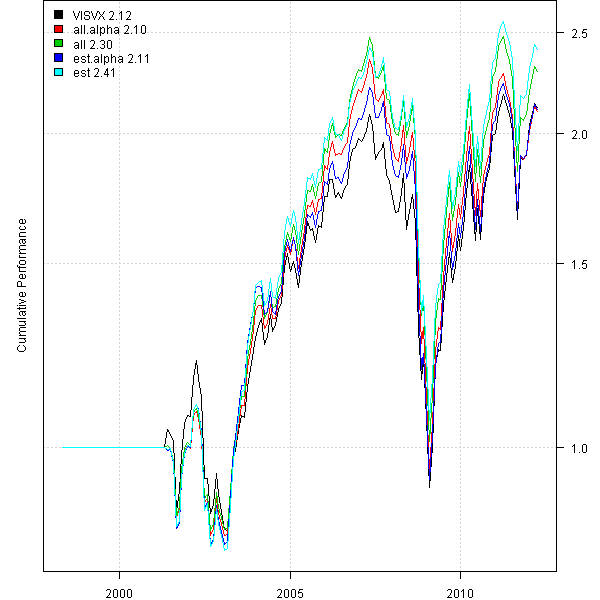 There is the Three Factor Rolling Regression Viewer at the mas financial tools web site that performs rolling window Factor Analysis of the “three-factor model” of Fama and French. 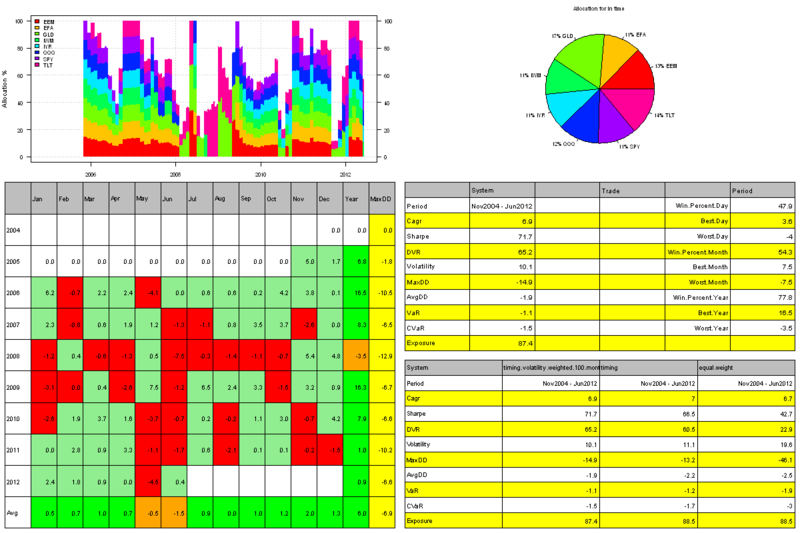 The factor returns are available from the Kenneth R French: Data Library. I recommend reading the Efficient Frontier: Rolling Your Own: Three-Factor Analysis by W. Bernstein for a step by step instructions. 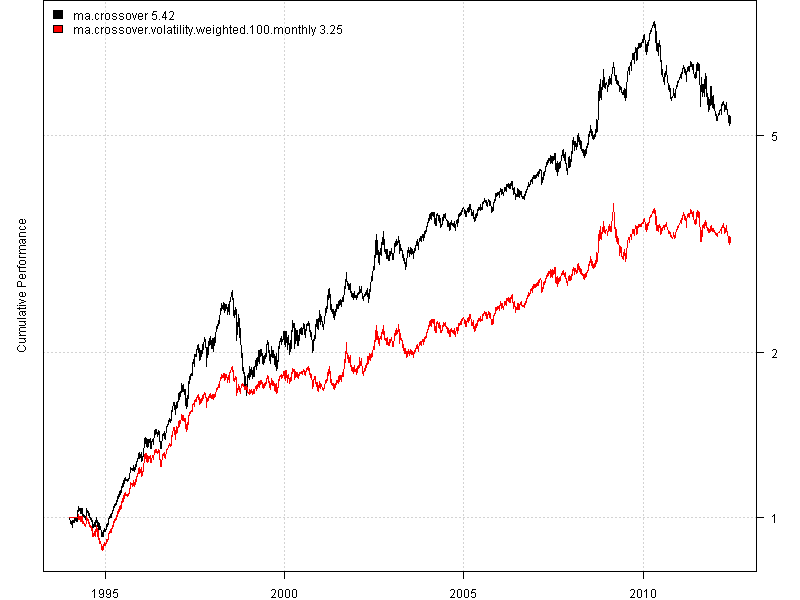 Let’s start by loading historical returns for the Vanguard Small Cap Value Index (VISVX) and aligning them with Fama/French Monthly Factors. Please note I wrote a helper function, get.fama.french.data(), to simplify process of loading and analyzing factor data from the Kenneth R French: Data Library. All factor loadings are significant. 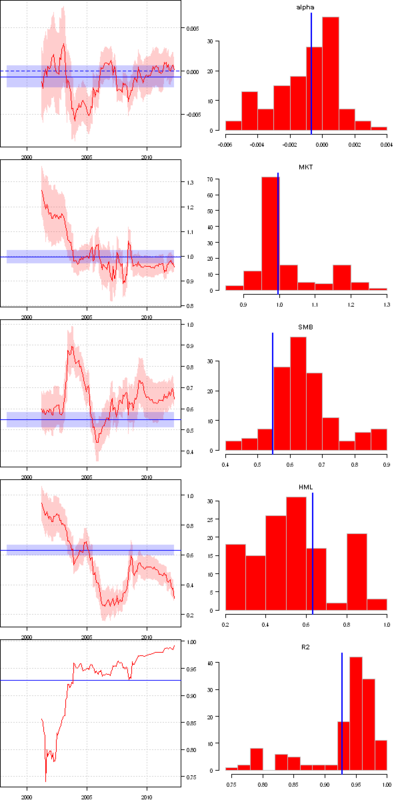 Finally, let’s re-create the timeseries and histogram charts as presented by Three Factor Rolling Regression Viewer. 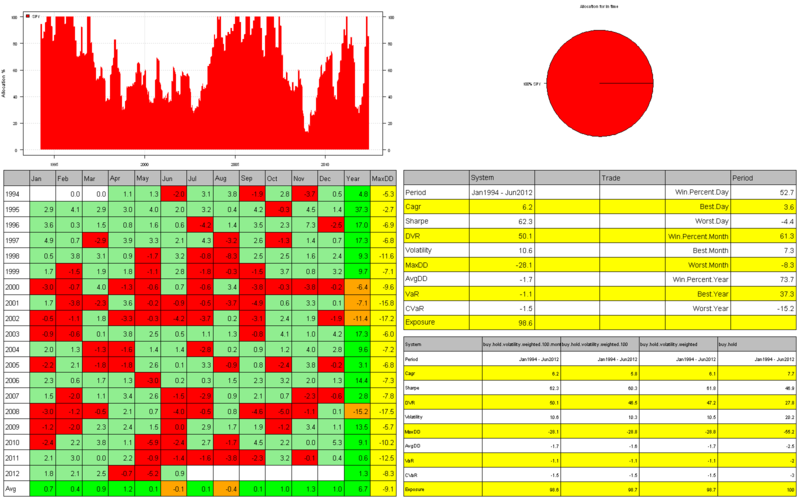 In the next post, I plan to replicate the Style charts and provide more examples. 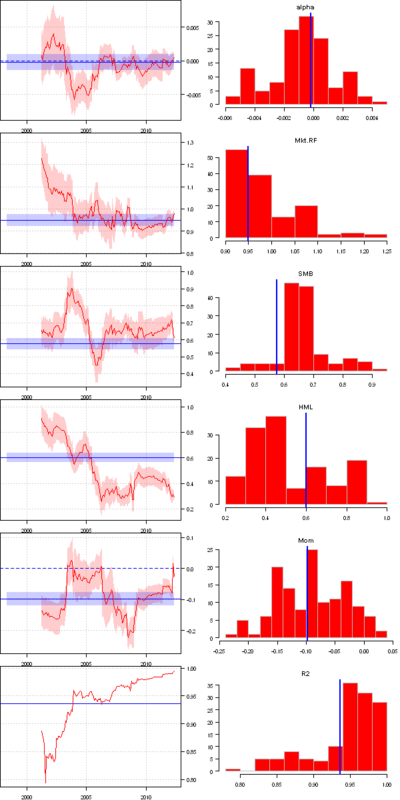 I have discussed Volatility Position Sizing in the Volatility Position Sizing to improve Risk Adjusted Performance post using the Average True Range (ATR) as a measure of Volatility. 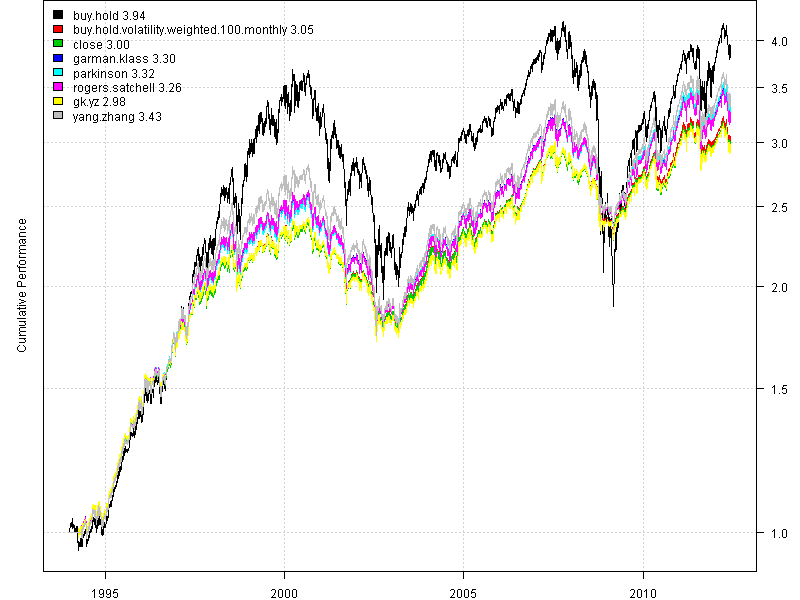 Today I want show how to use historical volatility to adjust portfolio leverage. 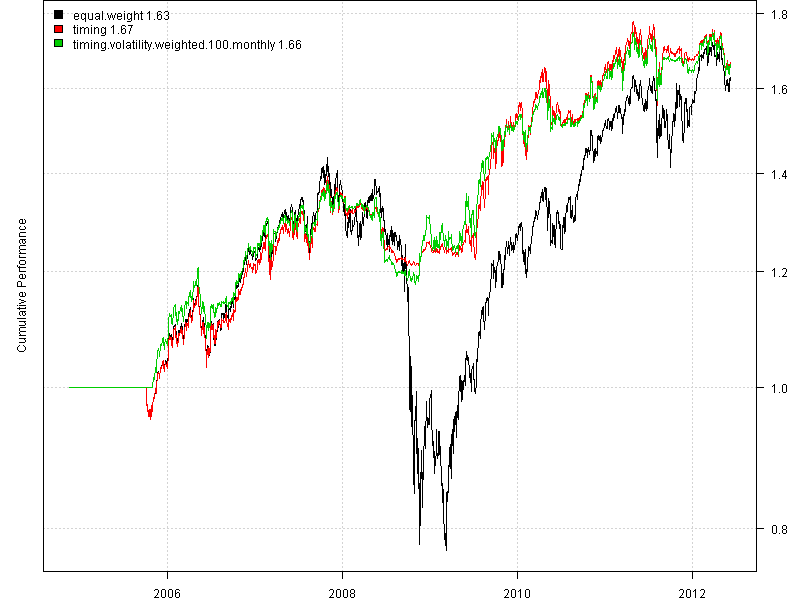 Let’s start with Buy and Hold strategy using SPY and rescale it to the target volatility of 10%. 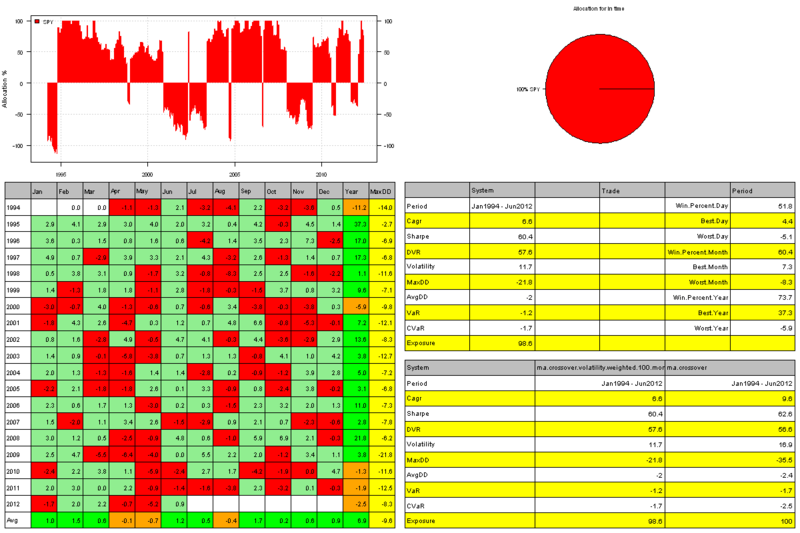 I will use a 60 day rolling historical Volatility to adjust portfolio leverage in order to target 10% annual Volatility. 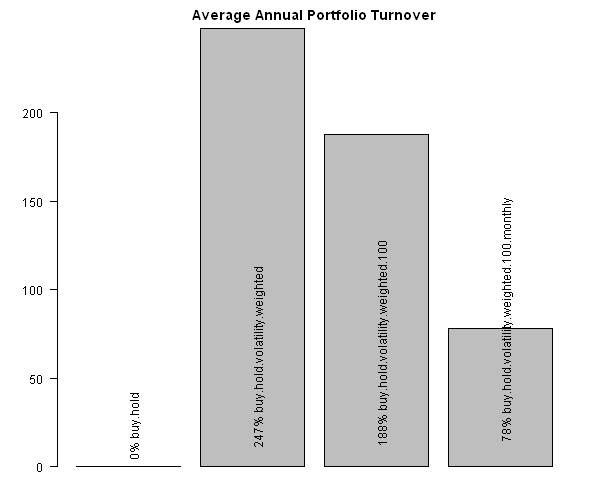 All strategies do a good job of rescaling portfolio leverage to the target 10% volatility. 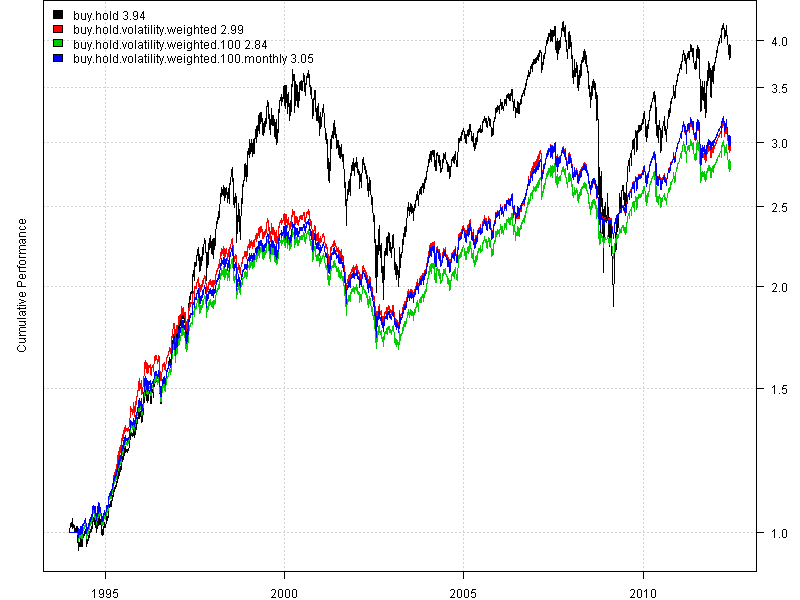 The simple historical volatility does the best job at targeting volatility and controlling drawdowns. 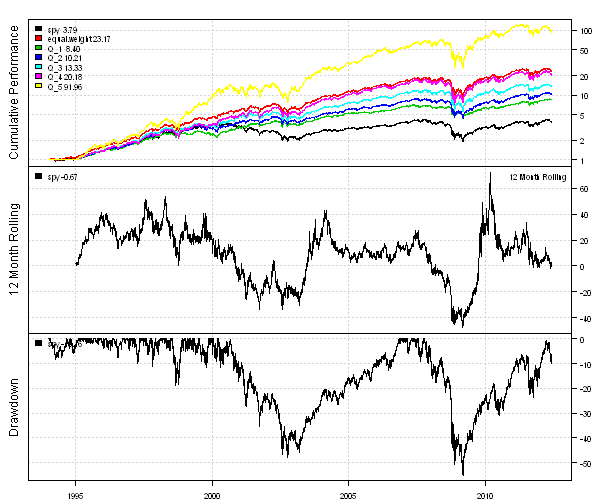 Next let’s apply idea of Volatility Position Sizing to the strategy’s Equity Curve. The Volatility Position Sizing does keep strategy’s volatility close to the target 10% volatility. Volatility Position Sizing is one of many Position Sizing algorithms that can be part of your money management rules. Let me what Position Sizing scheme works best for you. To view the complete source code for this example, please have a look at the bt.volatility.position.sizing.test() function in bt.test.r at github.